Happy Monday! Anyone else get dumped on by Mother Nature over the weekend? We were "lucky" enough to get 30+ inches of snow starting Friday evening into late Saturday night. It really put a damper on my building and furniture striping plans, but it sure was nice to have an excuse to sit around and do nothing. I did manage to complete a little craft project, but most of my time was spent finishing up Sons of Anarchy! 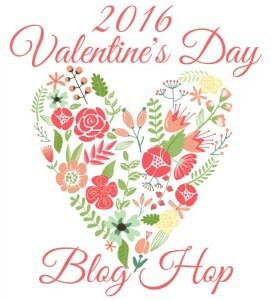 Danielle from Creatively Homespun invited myself and 19 other talented bloggers to join her in a Valentine Blog Hop. 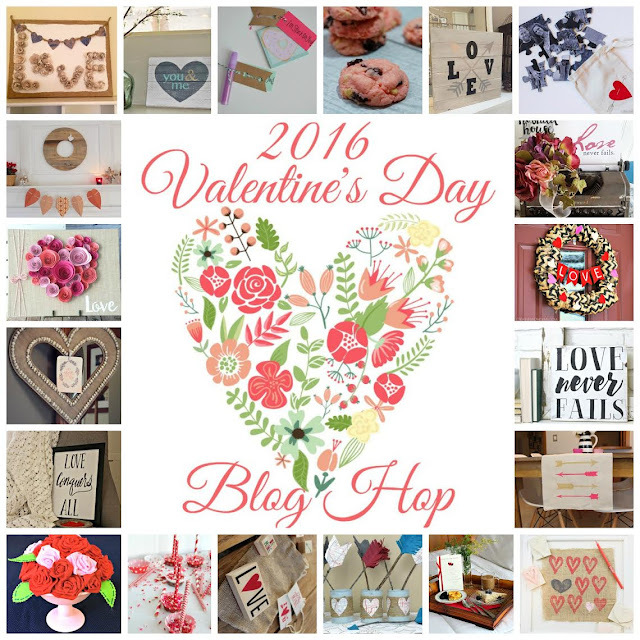 Each of us created a fun Valentine project to share, so make sure to check out everyone's projects at the end. 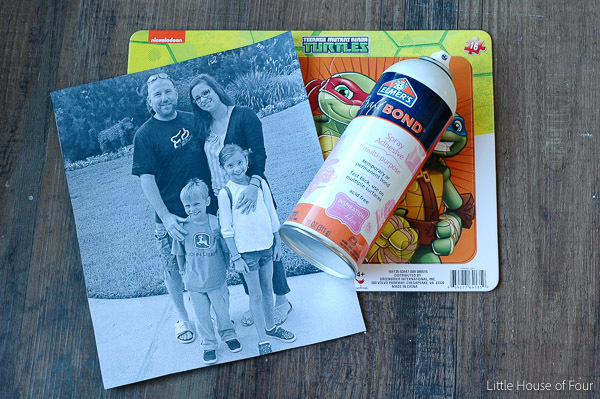 There's nothing more thoughtful than a DIY Valentine gift! Let someone else buy the over priced roses, they're just gonna shrivel up and die in a few days anyway. 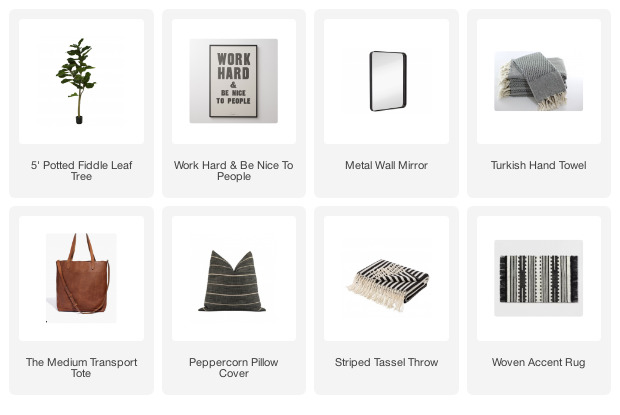 Why not make a gift that will last? It doesn't have to be complicated or cost a lot of money to show that you care. This year, I decided I wanted to make a personalized puzzle for our kids. All I needed was a cardboard puzzle from the Dollar Tree and a cute little drop cloth bag from Target's dollar spot. Yup, this thoughtful gift cost a mere $2.00 to make! 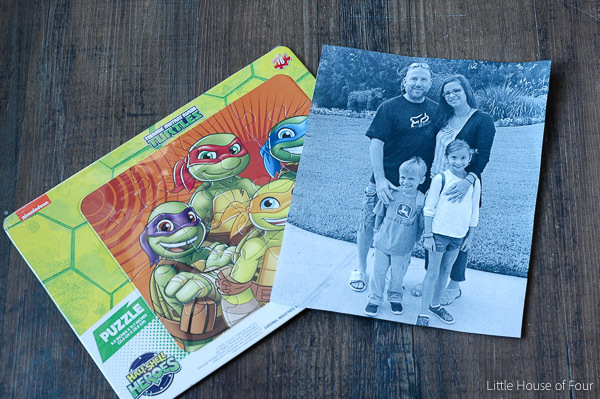 I started by resizing and printing out a black and white family photo from our recent Disney trip. Leaving the puzzle intact, I sprayed the front with Elmer's spray adhesive then carefully laid my picture on top. 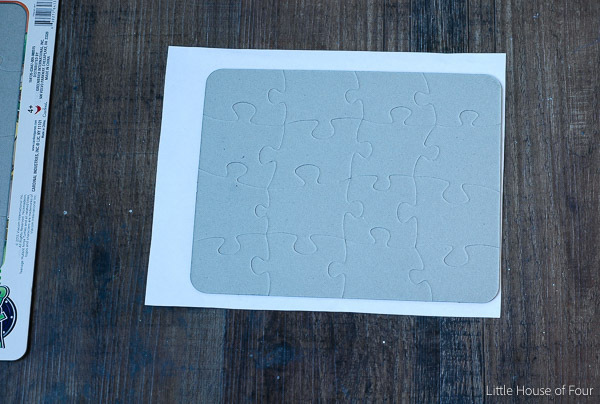 Once I had the picture smooth I flipped the puzzle over and off the cardboard backing. This part was pretty tedious and took patience, but was totally worth the effort. 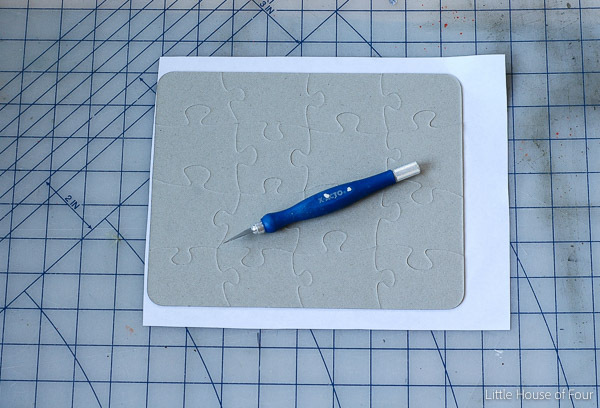 Using an exacta knife (make sure you have a sharp new blade) I carefully traced each puzzle piece, cutting through the picture on top. 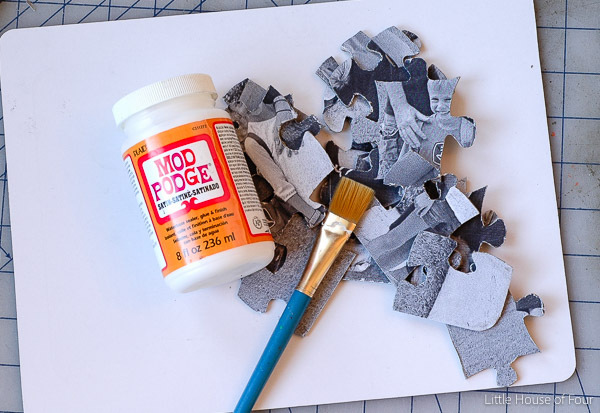 Once I had all my pieces cut, I applied a very thin layer of Mod Podge to protect the puzzle. That's it! 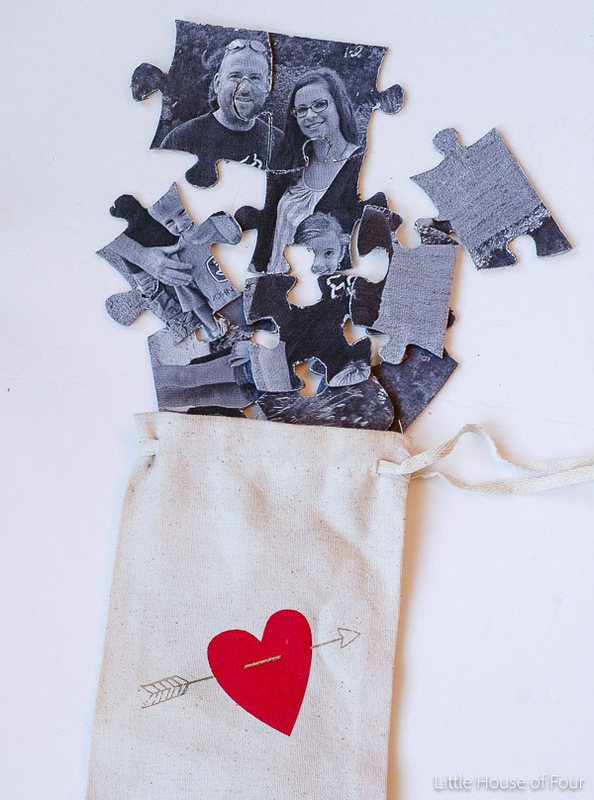 Now you can give your puzzle in a cute bag, making for the perfect personalized Valentine's gift. Want even more Valentine's gift and decorating ideas? Check out these rest of the 19 clever projects! You are so creative and smart! This is a perfect Valentine gift. so happy to share the hop with you! Cheers to a wonderful week! Great gift idea! I love this! This is such a fun idea! 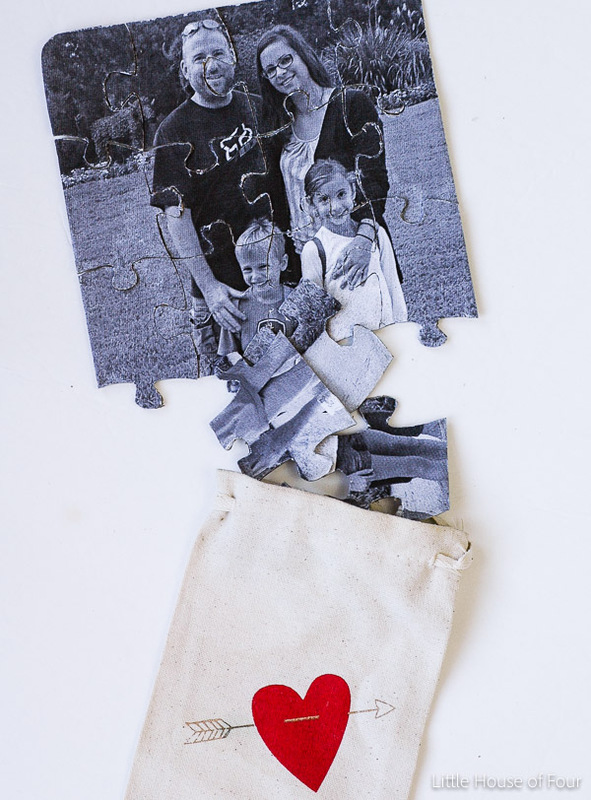 I think I'm going to do this with my kids and let them make puzzles of themselves :). This is the coolest thing! I just love it! This is such an adorable idea! So adorable, in fact, that I'm going to make one for my girls! 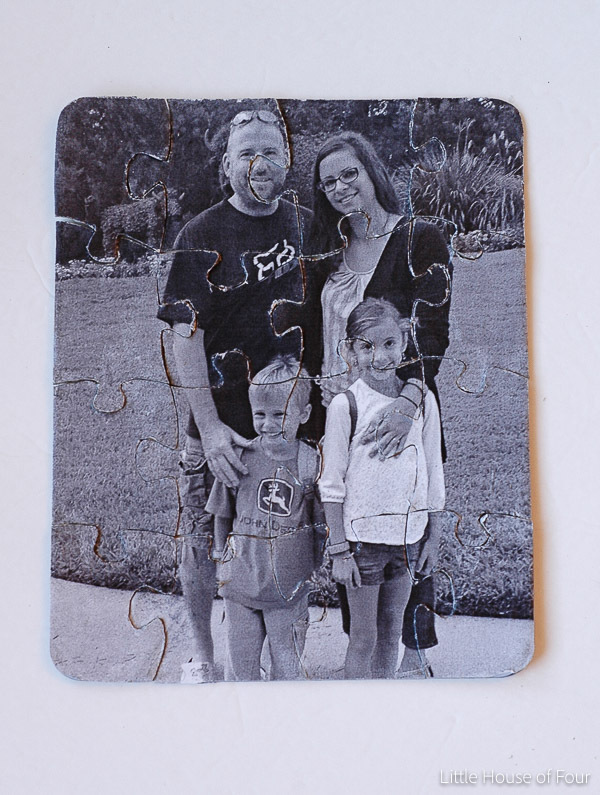 Great idea to just use any type of puzzle and put the picture on top. I think I might have a couple of heart shaped blank puzzles left over from my classroom, and now I know what to do with them. Thanks for the great idea!! Cutest gift idea ever! 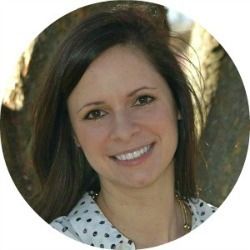 I love the idea of giving them to faraway family! Can't wait to make this as a gift for someone. Thanks for the tutorial. Love it! 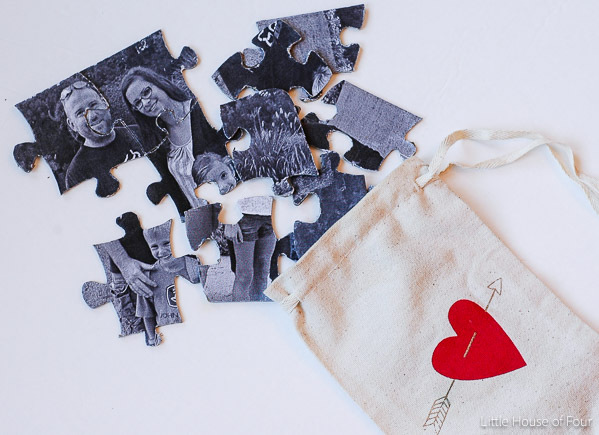 Such a cute and thoughtful gift and what a great idea to make it with a dollar puzzle. So fun! What a great idea! 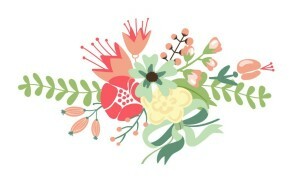 I'm gonna use this for game-night party invitations, no picture, but a print out of the invitation. Thanks!